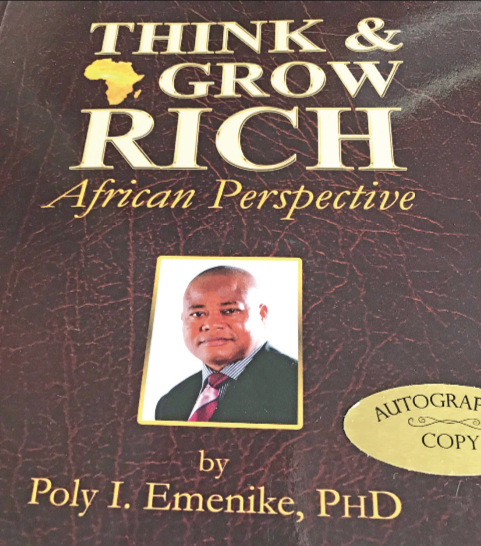 Nigerian entrepreneurs, captains of industries and leaders of thought who have read THINK AND GROW RICH—African Perspective say about Emenike’s new book. Bliss! That is the word to describe the feeling that envelops me each time a new book lands on my table. The happier I am if the book is my own book like the one newly released (but not for the public yet) “GIANTS of AFRICA” series starting off with the Nigerian and African business icon—the one they call THE GURU. But this is not about my book. Rather, I am here today to celebrate another Africa-oriented book written by a friend of mine who makes it a point of duty to send me an early autographed copy of his books once they come out. “I believe completely in Dr. (Napoleon) Hill’s view. Success is not achieved because of quantity of education or chains of degrees one has. The most important element is the definite desire or purpose one wishes to achieve and the practical steps of achieving it. If you devote time to study the lists of the people that Dr. Hill analyzed before he wrote the classic book, you will see that there are not many academic professors in the life histories of the 500 men and women he analyzed. “Dr. Hill has actually disclosed to us chapter by chapter all the success stories of how one could achieve anything, at any level one wants, and the person’s pace. It is therefore important to notice that, for one to achieve anything, identification of definite goals and steps of achieving such desires are the main keys to success, regardless of the type of success needed. The above quotes are excerpts from the spanking new book by my friend Poly. I. Emenike, an entrepreneur, scholar, author and devotee of Napoleon Hill, the legendary American author of THINK AND GROW RICH, a book that has taught many the secrets of wealth making. So enamoured and dedicated to the ideals of Napoleon Hill, Poly Emenike has written an Africanized version of the timeless book which he bought as a kid from an Onitsha market bookshop and read religiously to the point where he truly became a rich man and an entrepreneur of great renown. I have not seen any African who is so fully committed to evangelizing the gospel of riches according to Napoleon Hill. This is not Emenike’s first book. In fact, this is his fifth book targeted at anyone who wants to know the secrets of being rich unlocked in a practical book rich in case studies and motivational words of wisdom.